Cristobal de Col and Melanie Giunta earn top honors at the QS Event in San Bartolo, Peru. SAN BARTOLO, PERU (Wednesday, October 17, 2018) – The 2018 Reef Paris Peñascal Pro ended in a Peruvian celebration as athletes from the host country won both Finals in solid waves at Peñascal in San Bartolo, Peru. Cristobal de Col (PER) defeated Lucas Silveira (BRA) at the Men’s QS 1,500 followed by Melanie Guinta (PER) taking home an all-Peruvian affair against Anali Gomez (PER) at the Women’s QS 1,000. Giunta has been on a roll lately with two consecutive wins. Last week she won the São Chico Eco Festival in Brazil and followed with a win in front of her hometown crowd. With these expressive results, Giunta has closed the gap in the race for the 2018 WSL South America Title and is now around 900 points behind rankings leader Dominic Barona (ECU). The next stop on the WSL South America Calendar is the Men’s and Women’s QS 1,000 Itacaré Surf Music at Praia da Tiririca in Bahia later this week. Afterwards, the Men continue to Maresias for the QS 3,000 Red Nose São Sebastião Pro from October 31 to November 4 and will determine the WSL South America Title. The Women meanwhile will head for the decisive event at the QS 1,500 Maui and Sons Pichilemu Pro in Chile from November 2 – 4 in Punta de Lobos. On the Men’s side, things have bottlenecked at the top of the WSL South America rankings with Alonso Correa (PER) in 1 st place with 2,280 points followed by Wesley Santos (BRA) with 1,880 and Jeronimo Vargas (BRA) in 3 rd with 1,420. Close behind are the Chileans Guillermo Satt and Nicolas Vargas in 4 th and 5 th place respectively. There were plenty of scoring opportunities on Finals day with waves in the 3-5 foot range (1-1.5 meters) and a heavy close-out section at Punta de Lobos. Cristobal began the day by defeating Guillermo Satt in the Quarterfinals, then took down Luel Felipe (BRL) before taking down an in-form Lucas Silveira (BRA) in the Finals. The 2018 Reef Paris Peñascal Pro was also the first time a WSL sanctioned event partnered up with ALAS (Latin America Surfing Association) to strengthen the South American surfing community by providing a wider platform for fans and the surf industry as well. “It’s an honor to be part of this event, to see Peruvian surfers doing so well and to see the WSL and ALAS working as one to see the best surfers getting better opportunities to compete in bigger contests and have the chance to qualify for the Championship Tour one day,” said Cristobal de Col.
For the Women, Giunta was faced up against the powerful veteran Anali Gomez; the only 3-time Women’s WSL South America Champion. 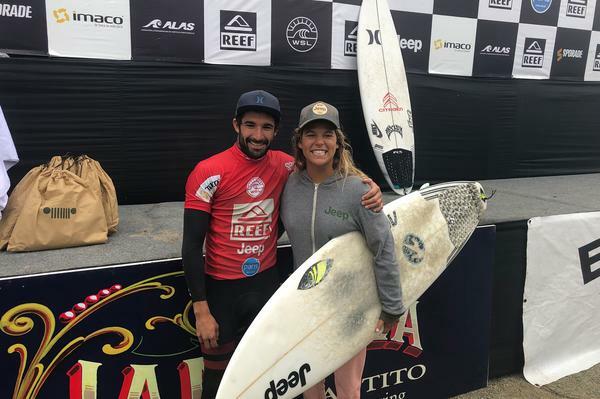 The two Peruvians have plenty experience at Punta de Lobos, but Giunta found the best waves of the Final and took an unsurmountable lead of 13.67 to 4.70 for the event win. Melanie still has to gain some ground if she wants to become the continental champion. She can win the title if Dominic Barona does not make it to any Finals in the last two QS events on the WSL South America calendar. Close behind them in the rankings are Monik Santos (BRA) in 3 rd place and Camila Cassia (BRA) in 4 th. Both WSL South America Titles are still up for grabs and will be decided in the upcoming weeks. It is important to note that each WSL Regional Champion is automatically guaranteed a spot on all QS 10,000 and QS 6,000 rated events in 2019.